It was developed by the military and originally used for parachute suspension lines. Over time people discovered it could be used for all kinds of survival, outdoor, home and craft situations. Both types are the same size, have the same breaking strength and feel/look basically the same. 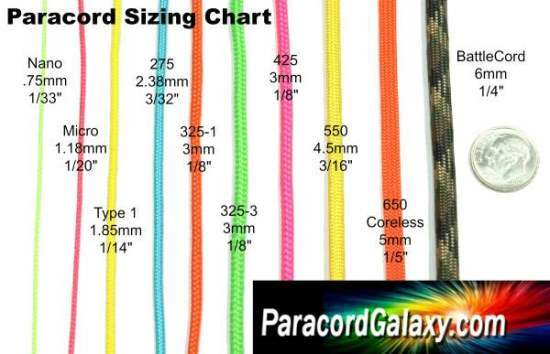 See our paracord color charts. Paracord was developed as "parachute cord" - the thin strands of cord that support a paratrooper under his parachute. It was widely used by the US military during World War II. Parachute cord is made from nylon so it is thin, strong and light weight. The military established standards for its production, with the most common type comprised of 7 strands having a collective breaking strength of 550 pounds. Thus, most cord produced is 7-stand, 550 paracord. Troops in the field quickly found many uses for the cord, from tying down equpment to suspending items from packs to first aid uses including tourniquets. The cord is still used extensively by the military. It has even been used in space by astronauts as they repaired the Hubble Space Telescope. As soldiers returned home they sought sources for paracord so they could continue to use it in everyday life. Military surplus stores have sold it for years. Today many manufacturers produce cord to military specifications and also in a "commercial" grade. As consumers discovered the cord, demand went up and a wider variety of cord has been produced. Today we are able to offer hundreds of colors of cord in several different sizes. The 7-strand 550 paracord is still our best selling item. All of the 550 paracord we sell is manufactured to military specs but only some is made in a mill that has been certified to meet us military specifications. We sell some "mil-spec" cord that is certified, and it tends to be a little more expensive. Because of its versatility, paracord has long been valued as an important item for survival kits. A roll easily fits into a kit and adds very little weight. Ingenious people soon learned that you can weave paracord into products useful in everyday life, that can also provide a ready supply of cord for use in an emergency. 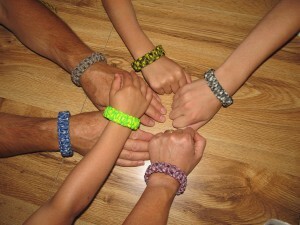 For example, paracord survival bracelets have become very popular. Choose from many, many patterns and you can create an attractive bracelet that is fun to make and also to wear. Then, if needed, you can unravel the weave and have a length of cord available for use in a survival situation. The same is true of belts and other items. In fact, when unraveled a belt may provide more useful cord than a bracelet. Paracord is much like duct tape - it can be used for hundreds of practical applications. Many people find it enjoyable to discover new uses, and to weave or otherwise create useful items from cord. Like knitting, it can be therapeutic to create items by weaving paracord. Many people create items from paracord that they give as gifts or sell during fund raisers. Many veterans groups, school clubs and other organizations make and sell paracord products to raise money. Many people have developed successful businesses making and selling products using paracord. The market for finished products has become large and appears to be growing. 7-strand 550 Type III paracord was the original paracord used by the US Military and it continues to be our most popular product. It has a diameter of about 4.0 mm (5/32"). Most of our 550 paracord is made in the USA but we do offer some from overseas manufacturers. In both cases the 7 core strands are nylon and they provide the cord's strength. The two varieties have a little different feel and they respond differently when being joined or otherwise manipulated. All of our products are clearly marked so you can tell if they are nylon/nylon or polyester/nylon. Both types have a 550 lb breaking strength rating. Cord that is smaller than regular 550 is often referred to as "tactical." Since it is smaller, it is easier to carry, include in survival kits and/or to conceal. We offer several varieties of tactical cord. Our 425 Tactical Paracord has a diameter of approximately 3mm or 1/8" and a test strength of 425 lbs. The 3 inner strands and the outer sheath are 100% nylon giving it excellent strength as well as UV, mold and mildew resistance. Our 435 cord is all made in the USA. We offer 275 tactical paracord from two different manufacturers. One has a diameter of about 2.5mm and the other has a diameter of about 2.38 mm. Both have a strength rating of 275 pounds. This cord is considerably smaller than 550 paracord and is usuful when making smaller items or items where not as much strength is needed. This cord has a larger diameter than Micro Cord but smaller than 275 Tactical Paracord. It is approximately 1.85 mm or 1/14 inch. Our Type 1 Paracord is proudly made in the U.S.A.
We also offer nylon cord in smaller sizes. Our micro cord is 1.18 mm and our nano cord is 0.75 mm. Our manufacturers have developed custom colors for us so we can offer hundreds of combinations and patterns. We have many cords that are reflective, some that glow in the dark and some that glow under black light. Most paracord products are made by braiding and weaving cord. If you braid together multiple cords of different colors you can create interesting patterns, and the resulting product is also stronger than a single strand of cords. Our tutorials section has instructions to help you learn to do various braids to create attractive bracelets, lanyards and other items. If you search the Internet you will find hundreds of fun patterns. Knots are important in creating paracord products. Knots can be large or small and can become part of the design of the product. Instructions for tying various knots can be found on our website, and via Internet searches. Cord can also be joined by melting the ends together. The nylon cores fuse together to create joint that is almost seamless and quite strong. 550 cord that has a nylon sheath and nylon core can readily be fused with any similar cord. Cords that have a poly sheath and nylon core fuse different and so many people choose not to try to join poly to nylon. Common lighters are often used to melt the cord ends. You can also use the flame from a gas stove or most any kind of burner that has an open flame. Jigs can be used to hold cords as you work with them. Some braids are much easier to do with the aid of a jig. Lacing needles, called fids, can be used to thread cord while making braids and tying knots. The end of the cord is trimmed an an angle and the resulting tapered end is twisted into the fid. Internet, pay attention to see what is being used to held and manipulate the cord. Strandard 550 paracord is still our best selling item. All of the 550 paracord we sell is manufactured to military specs but only some is made in a mill that has been certified to meet us military specifications. We sell some "mil-spec" cord that is certified, and it tends to be a little more expensive. 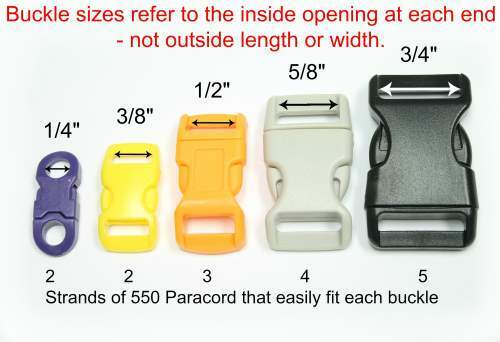 Plastic and metal buckles are perhaps the most common accessories used for paracord projects, such as bracelets and belts. Buckles come in an incredible variety of shapes, sizes and colors. Some have been tailored to provide useful functions. For example, some buckles have an integral whistle, which adds utility to a survival bracelet. Shackles, snap hooks, rings, carabieners and other items are often used in leashes, lanyards, slings and other products. Many kinds/colors/styles of beads and charms are available that can be used to decorate paracord creations. Other speciality items like cord locks and ends add utility. There is no end to the way paracord can be used, or to the accessories that can be used with it to create useful or decorative products. Many of our customers create paracord products that they sell on the Internet (etsy, ebay...), at swap meets and at retail shops. Most do it as a profitable hobby; a few have turned paracord into profitable full-time businesses. We get calls virtually every day from disabled veterans who make and sell paracord items to supplement their incomes. Many others sell items as fund raisers for veterans groups, hospitals, school groups and other organizations. Launching a small business can be challenging. In this case you can eliminate much of the risk be starting on a small scale, making things as a hobby and testing to see what you can sell, working out your sales outlets before making a major commitment to a business venture. Be creative and the sky is the limit. We have one customer who supplies bracelets to a neighbourhood gun shop. They buy as many as he can produce and so he has a stable, profitable business. One husband/wife team do paracord full time and travel to swap meets. They report that they sell virtually all of their inventory at every meet. Be sure to check business regulations where you live. As with any financial venture, you need to use caution as you learn the ropes.